Tortugas Marinas/Sea Turtles | ¡VidaMaz! One of the many fortunate aspects about living on the beach in Mazatlán is that often, whether we’re walking the beach or the malecón, or sitting on the beach eating lunch or dinner, a marine turtle may suddenly crawl up to shore to lay her eggs. It is always cause for joy. It is such a gorgeous miracle to witness, and one we can easily take for granted. The season starts in September each year, and yesterday I saw my third sea turtle so far this year. 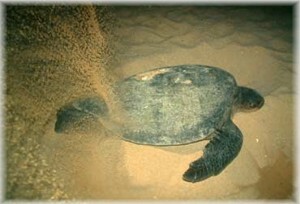 The turtle is usually fairly strong as she crawls up onto the beach. She is obviously made for the water, and struggles in the sand, but she crawls up to well above the high-tide line. She settles on a nesting spot, and then begins to dig a hole in the sand. 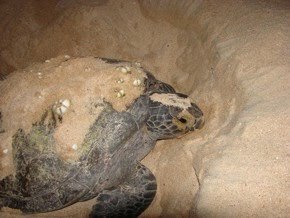 The turtle then buries her backside in the sand, above the hole, and lays her eggs. They lay a LOT of eggs at once. After she lays her eggs, the turtle usually rests for a few moments, but she is also usually very eager to get herself back into the ocean, where she is more mobile and less at risk of harm. It is so very heart wrenching to watch the mother sea turtle make her way back over the sand and into the ocean. She has no energy left, she is so very tired, and she just struggles something awful. Most people who watch tend to start cheering her on from a distance. It’s a nice community-building event. 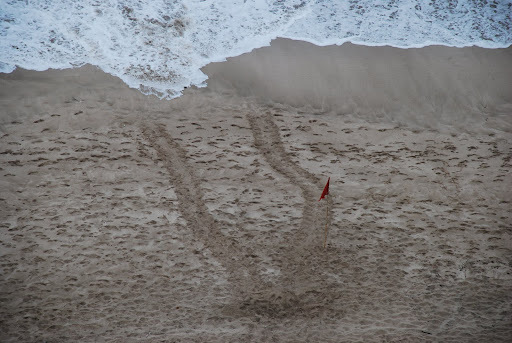 Here is a photo taken from our terrace of a turtle’s tracks, in and out, to lay her eggs. You can see the spot in the sand where she laid her eggs. 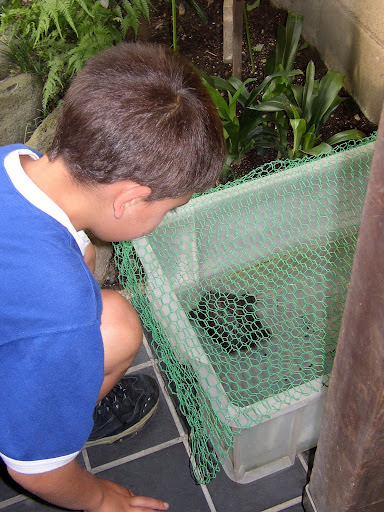 This photo was taken after the Aquarium official had already removed the eggs for safe-keeping. 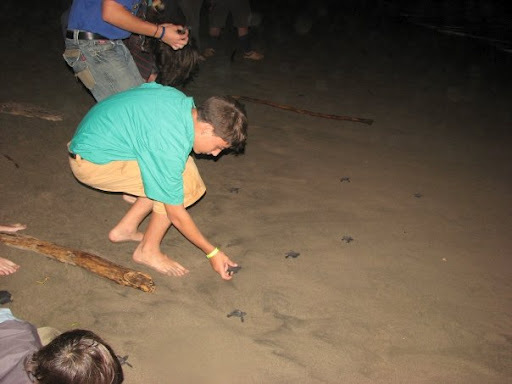 Sea turtle eggs unfortunately fetch a high price on the black market. I think people eat them as an aphrodisiac. Some people also kill the endangered turtles; “caguama” is a beloved, though black market, dish for many Mazatlecos, sadly. People use turtle hide to make things, and they use the oils in skin lotions and creams. Years ago I remember seeing a lot of turtle lotions and items for sale in the beach areas of Mexico. Fortunately these days we see a lot less. There are signs everywhere on the beach that if you see a turtle, please call the police or the aquarium immediately, as they will come to keep the people away (so that the turtle can lay her eggs in peace), and they will make sure no one steals the eggs. I definitely want to see this! 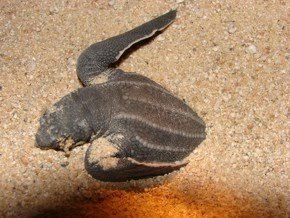 We saw the baby turtles in Oman several years ago, but the weather was too bad for us to see the mothers come onto land and lay their eggs. There they do it at night. 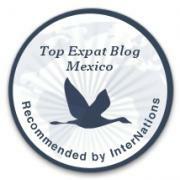 Pingback: Our Beloved Malecón de Mazatlán | ¡VidaMaz! 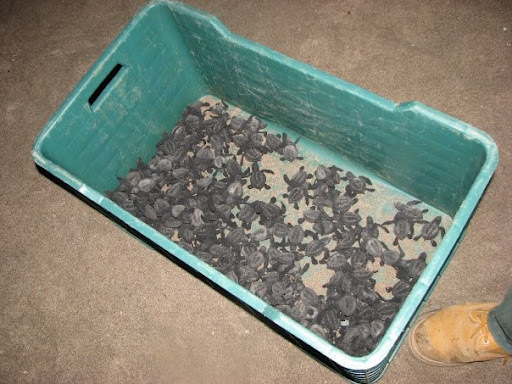 Pingback: Baby Sea Turtles | ¡VidaMaz!